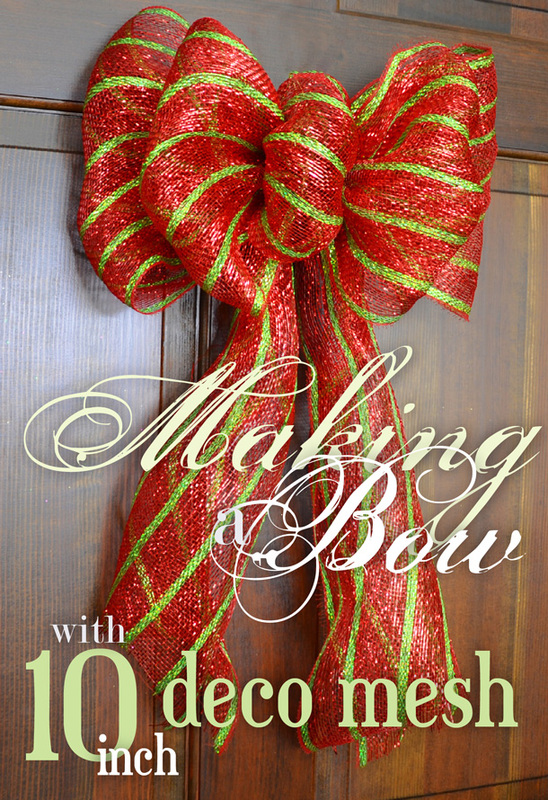 Creating a beautiful and professional-looking bow for the holidays or special occasions is much easier and faster than you think, all thanks to Deco Mesh. 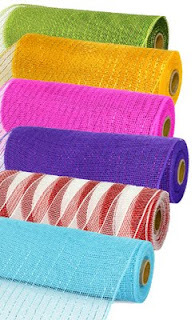 Deco Mesh is a type of soft plastic fabric mesh that is great for wreaths, garlands, Christmas tree decorating, gift wrap and much more. Plus, it holds its shape and is durable enough for outdoor decorating. 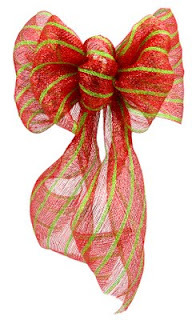 This Christmas bow uses a brand new product - 10 inch wide deco mesh ribbon, which comes in many colors, patterns and finishes. 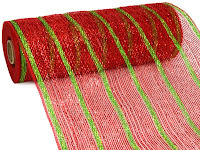 We used the Metallic Red/Lime Stripe roll. The only other supplies you will need are scissors and some craft wire or 2 pipe cleaners. 1. Form a loop at the end of the roll of 10 inch mesh. The first and center loop should be the smallest; this one is around 2 inches in diameter. Gather the loop into one hand, holding the bunched mesh between your thumb and index finger. 2. Make a second loop by bunching about a 9" length of mesh and bringing it to your other hand that is holding the loops of mesh. Try folding as you gather the mesh for a full look. 3. Repeat 3 more times. Continue making loops, going back and forth from both sides of your initial center loop. Each set of new loops should be larger than the previous ones you made. It really helps to have one hand hold the bow and the other gathering and forming loops. 3. 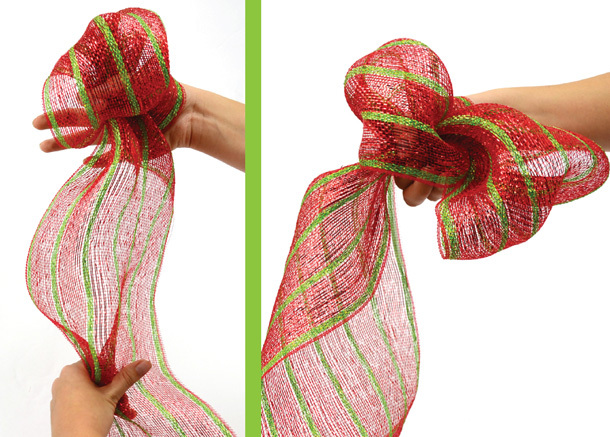 Secure the bow by threading craft wire or a pipe cleaner through the loops you have been holding. Twist the wire tightly several times. Now you can trim the mesh. 4. For the bow tails, cut about a 3' length of the same 10" mesh. Start rolling it at the middle. This helps the mesh look fuller for the tails. 5. Attach the tails at the rolled center to the bow, going around where you secured the bow with wire. 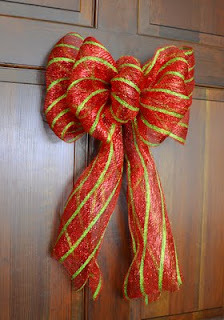 Use a pipe cleaner or craft wire to do this. Now your bow is finished! 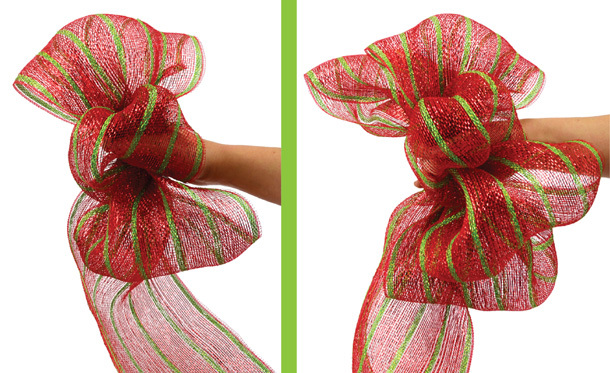 Many other colors and patterns are available in the 10 inch deco mesh so you can create a bow for any occasion. Don't be afraid to experiment with the size of the loops and the number of loops on your bow! Browse our blog for other great tutorials using deco mesh. 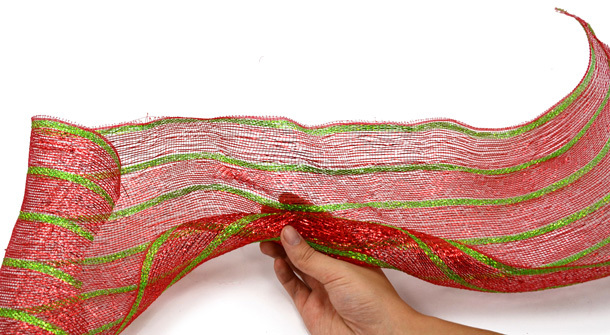 To watch a video on how to make a bigger bow with 21 inch wide Deco Mesh, click here. I made this with Christmas ribbon and put the bow in my outside urn which was filled with pine and cedar. Thank you very much. This is what I have been trying to do but didn't know how. Thanks soooo much! I think I can do this, finally!!!! Thank you for the tutorial! It took me a few times repeating the steps until I got it to my liking;However, be careful to wear something that will not attract the mesh! I had on a lacey type shirt and the mesh kept sticking to it!! I would Love!! to start making these for the different holidays...but I'm going to need more hands-on-hands work. I like the look of this bow so much more than some I have seen made with the 20" deco mesh. 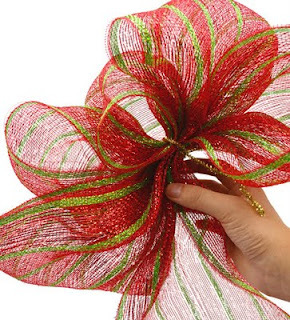 These actually look like a bow and not a mound of mesh. Thanks for all the wonderful comments everyone! If you like out tutorials, start following our blog and you'll be updated with a new post automatically. If you made a bow and have a cute photo we'd love to see how yours turned out! how do you keep the mesh from unraveling? Thank you so much. Just made one for my side entrance door. Looks great!! !